I’ve always admired the French–their lifestyle, art and cuisine. Most certainly I am appreciative of the myriad ways they knot their scarves! I’m also a fan of their green beans, “haricots verts”, essentially a long and slender version of your basic green bean. Anyone with decent soil and full sun can grow haricots vert, but I’ve always associated these beans with the French: So slender, so chic – with no strings attached! 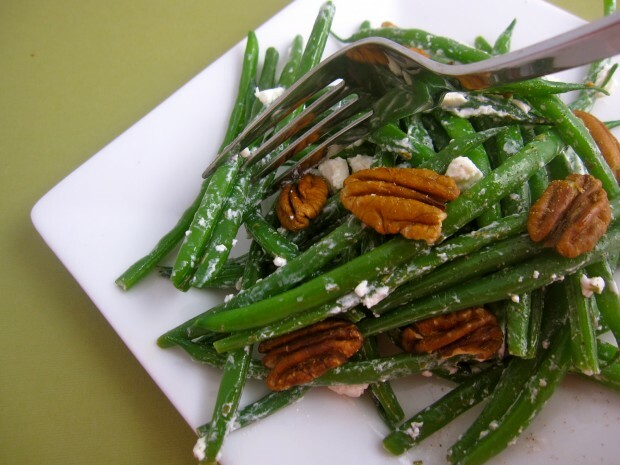 A dinner based simply on green beans is what I’m craving tonight. I’ve a weekend of Super Bowl meatballs, chicken wings and stuffed potato skins ahead so appreciate a somewhat refined dinner centered around a vegetable– the perfect antidote to game day snacking! I find fresh, whole green beans cook better in boiling water than when steamed, the boiling water cooks them evenly and they remain crisp. I shock my beans in icy cold water so they retain their vibrant green color. Macerate (soak) shallot in vinegar 15 minutes. Meanwhile, bring a large pot of salted water to a boil. 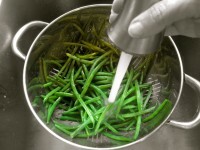 Boil green beans 2-5 minutes, depending on thickness of green, or until crisp tender. Drain and shock with ice water. Toss with goat cheese and season with kosher salt and freshly ground pepper. Garnish with toasted walnuts or pecans and serve.